Riggan Thomson (Michael Keaton) is a washed up Hollywood actor, trying to restart his career on stage by directing, producing and starring in an adaptation of a Raymond Carver story. After one of his actors sustains a major injury, he recruits renowned Broadway actor Mike Shiner (Edward Norton). However when Mike begins taking over the play and stealing the attention, Riggan's plans prove more difficult, as he must attempt to overcome his family issues and his own ego in an attempt to retain his glory. Birdman was the first film of 2015 that I had especially high expectations for, and it managed to exceed them. 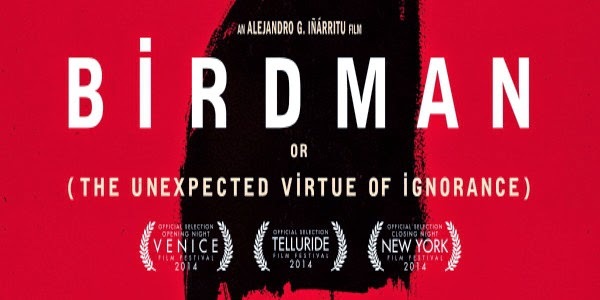 So rarely does a film come along that boasts masterful technical achievement with a unique story, a smart script and well developed characters to support it, but Birdman is the complete package. Directed masterfully by Alejandro Gonzalez Inarritu, a director whose films I'm beginning to really appreciate, Birdman not only takes flight, but soars above and beyond any technicality driven wide release since Gravity. All round, this is pretty great stuff. When I first heard that Birdman would go its entire narrative without cutting I dismissed it as a rumour. "No way could that be possible" said I. Yet, here we are and here it is, lasting an astonishing two hours with not a single cut. Well, technically Birdman does cut in brief segments at the film's beginning and close, but for the main narrative, the camera action is seamless. Stunningly shot and framed by cinematographer Emmanuel Lubezki, Birdman is masterful in its technicality. Even when we remain in simple dialogue driven scenes, Lubezki places the camera in obscure positions at unusual angles, consistently reminding us that this is not an ordinary film. There are moments where you will know where the camera is, and even where it needs to go next, but Birdman will always surprise you in how it gets there. It is simply quite astounding. Michael Keaton, yet to win his first Academy Award, is likely to do so with this film. Not only does Inarritu need Keaton to be dramatic and emotional for the purposes of the film, he also has to act acting for the on stage sequences, and these sequences are where the film truly comes to life. Inarritu's interesting and unusual use of lighting for these scenes allow us not only an insight into the minds of the characters, but also sets the mood and tone of the upcoming sequence. Keaton steals this film, but his supporting cast are almost equally as terrific. Particular praise must be awarded to Emma Stone, who manages to make us care about her character (she plays Riggan's daughter) within mere moments of meeting her. She is especially impressive during an argument between her and her on-screen father in which the camera hovers in close up directly in front of her face, without cutting. It is breathtakingly tense, but also stunning performed. And on top of all of this, Birdman's story is so layered with questions and riddles and metaphors, but somehow never feels complicated or muddled. Whilst we do wait a long time before we get somewhere, it almost feels as if this was an intentional move on Inarritu's behalf, reflecting the life of Riggan and the unexpectedness of his career. The script is fantastically well written, giving depth to our characters whilst keeping the narrative interesting, and Antonio Sanchez's drum driven soundtrack is both unique and captivating. But Birdman's pride and joy lies in its technical achievement. In a year where many films dared to be different (Boyhood took twelve years to film whilst Interstellar had to develop new software simply to render the complete film), Birdman's technical efforts stand high and mighty. There is a lot of competition for Oscars this season, with Boyhood set to take all the big ones, but here's hoping Birdman comes away with some trophies in hand by the end of it all. It's unquestionably worth it. To Summarise: Both technically masterful and emotionally resonant, Birdman is a phenomenal showcase for Inarritu's directorial talent and a strong example of what cinema can represent.